Last weekend, on a whim, I asked little man if he wanted to go sledding before the snow melted. Aww, so cute and as much as I complain about the snow during this time of the year on my site today, we truly haven't had this much to go sledding this year. So, my girls are totally bummed right about now, but god help us that could change in the blink of an eye as we still have all of February to get through now! Haha I can see why and how much he was enjoying it heheh! Of course! Sledding is a blast. Look at those smiles Rosey, you put those on his face. Good job Momma! LOL To be a kid again. We used to have a place called hernia hill that everyone would sled on in the winter. It hasn't snowed in Nebraska enough to go sled riding. He looks like he's having a blast! He is so cute! Mine are still waiting for snow here. This looks fun!! I haven't done this in AGES!!! Gosh he is growing up so tall! And yes of course that seems tons of fun! Of course he was ready to go before you finished the question. He's not only a handsome one, he's smart too. He is really having fun! It reminds me when I was little and our family would go sledding too. Have a nice day Rosey! Looks like fun! We don't have much snow left here. We are suppose to get another snow on Sunday - kids are already talking about going sledding if we get fresh snow. thanks for the linkup, Rosey! That looks like sooooo much fun. My boys have been dying for it to snow here so they can go sledding. Word on the street is that we are getting a few inches this weekend. That smile on his face = genuine happiness. :) You should frame it! Rosey that looks fun but oh so cold! Ah, the simple joy of a child! Those are great pics. If it must be cold out, we should at least enjoy it! If we had this amount of snow and I am talking about grass still visible in places schools in Central VA would be closed for a week. Looks like a fun time. Looks like fun! My kids LOVE to go sledding when there's just an ounce of snow on the ground! So fun! My boys would be right there with your son hanging ten down that slippery slope! ;) Have a great week! My kids would totally do the same thing - both the girls and the boys! Sounds like a fun time! You're a great mom to suggest that! Snow and kids go together beautifully and end in fun! This is sooo cute!! My kids miss sledding in the snow! We don't get any here in Florida. Now that's my kind of slippery slope! Can you believe my kids have never even seen snow? This looks like a ton of fun! I used to go sledding with my family all the time when I was younger! I'm glad you guys got to go sledding and wish I could go too! This looks like a great time. I would love to go sleding one day. Sledding is always so fun! Looks like he had a great time. Now that looks like fun. I remember sledding as a kid. Not so much now. That looks like so much fun! It makes me wish we got snow in the winter. Oh, he looks so happy! I miss the days my family used to go sledding down the hills in Central Park. Oh my Rosey! Your little man is getting big. He has gotten taller! So handsome. Enjoy the snow. That looks like so much fun. We haven't had a huge amount of snow around here so no sledding. By the time I get out there the snow has melted. Ugh. I know a good storm is coming. We still have a few more months of winter up here. Looks like he had a ton of fun! Who doesn't love sledding? Oh to be a kid again! I loved winter and going sledding. So much fun and joy on the faces! That's always a lot of fun! So jealous of the snow!! My kids just don't get to have these moments! I would love to take them to play in the snow! I used to love sledding when i was a kid. My kids grew up sledding down our local hill. It is a great activity for kids. How cute! I love a good snow day. We don't have those here anymore for some reason. Probably global warming. That's adorable! I need to take my boys when we have the next big snowfall. So adorable and it looks like a great time was had by all! Thank you for linking-up with us at the Oh My Heartsie Girls Wordless Wednesday Link Party. What an adorable photo story on fun in the snow. I'm glad your Little Man is enjoying the winter weather! How fun! Wish we had snow here! We love sledding here in Michigan when we get a ton of snow, we have a park near us with a big hill where we take the kids, always a fun outing. Sledding is one of the winter sports I love. Helps living in Wisconsin. Oh what fun. Good Times! Aww I wish we had snow right now so the kiddos could go sledding. Great pictures. That looks fun! We haven't had enough snow yet for sledding, but I hope we do soon. We have a great park near us that's perfect for sledding. Or going to the local country club, the hills there are ideal. There really is nothing better than a day on a sled! The kids love it every time. I wish we had something like this where live, but we are in the south and seldom get any snow. This looks like such a fun time for children. I do not like snow or cold weather, but I do appreciate other people enjoying it. We haven't had any snow yet, but looks like we will this weekend. My kids are jonesing to do some sledding! Oooooo how fun!!! Sledding is the one activity we haven't done this year! I need to get on this and do it!! I can't wait until we get snow, so I can take my niece to Central Park and go sledding as well. I love this picture full of great memories. This looks like he had such a wonderful time! I haven't taken my kids out sledding nearly enough this year, time to make some plans! Oh how fun! We tried to go sledding a couple weeks ago, but there was hardly enough snow. That is a strange thing for us to be saying here in Minnesota! Fun! We have gone sledding a couple of times this winter.the kids love it! What fun! I wish my kiddos could see snow more! 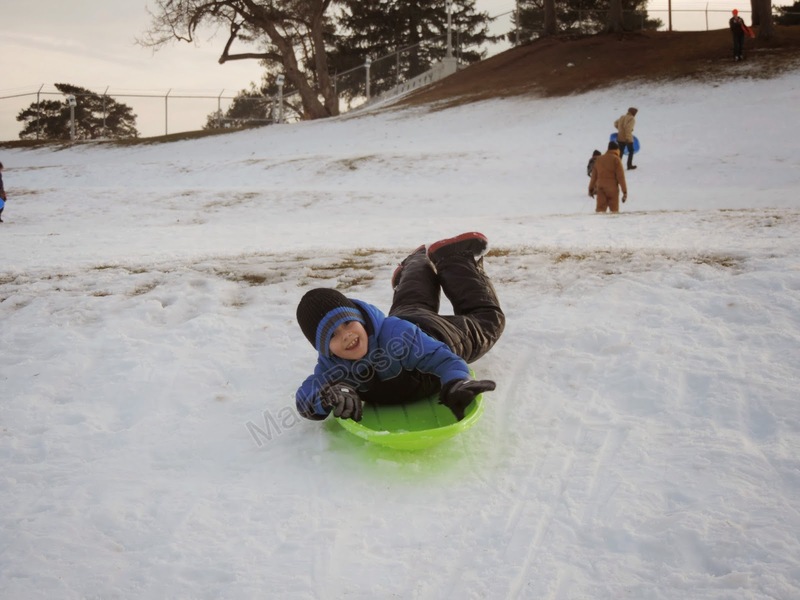 We haven't had any snow in Bama just yet but I'm hoping that we may get a little bit soon and then I'm hoping we can take our boys sledding on a slope down our road :) They will love it! We used to have so much fun sledding with my daughters when they were young. To tell the truth, taking them sledding was an excuse for us to get out and do it, too! That is such a cute title for your post! I love the pictures of sledding on the slope! My kids loved sledding in the snow when we lived where it snowed. I miss snow! He looks like he's loving life! It's supposed to snow tonight. Fingers crossed! Such fun! We just got a bunch of snow here in New England so hopefully some sledding is in our near future :) Thanks for sharing at the OMHG WW! 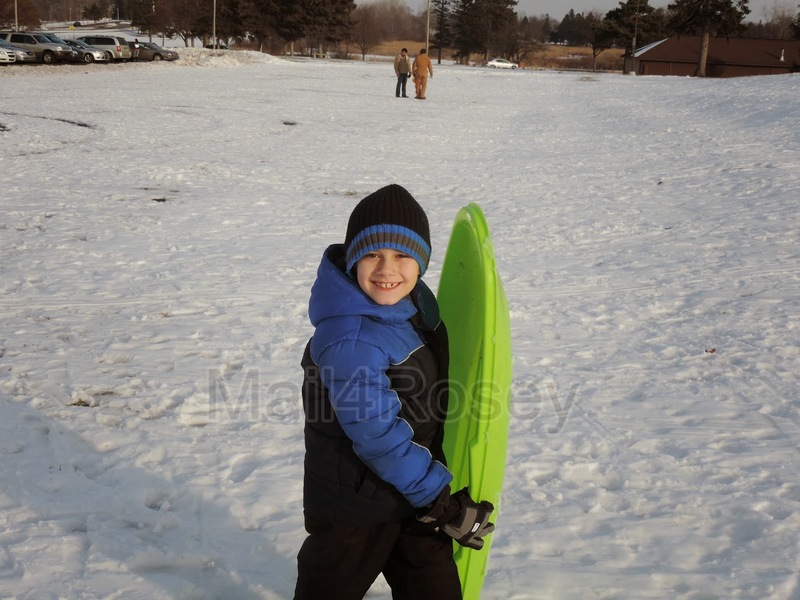 Looks like your little man really enjoyed sledding! That looks soo fun! My kids love sledding! My kids love snowing too. That is how we have spent the morning today. Playing in the snow. Thanks for giving me a big smile. So cute and looks like much fun!!! Looks like so much fun! We've only had a couple of dustings of snow this winter. My kids are dying for a good snowfall!